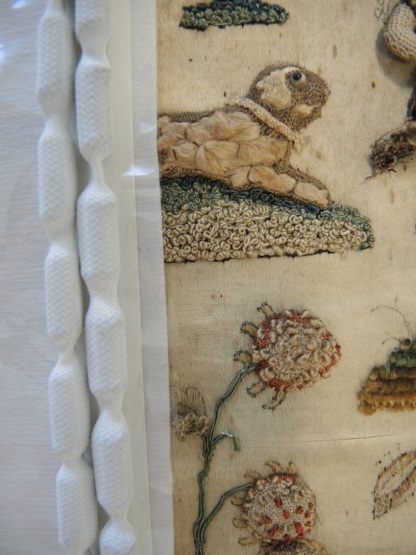 Kate was previously an Assistant Textile Conservator at National Museums Scotland. 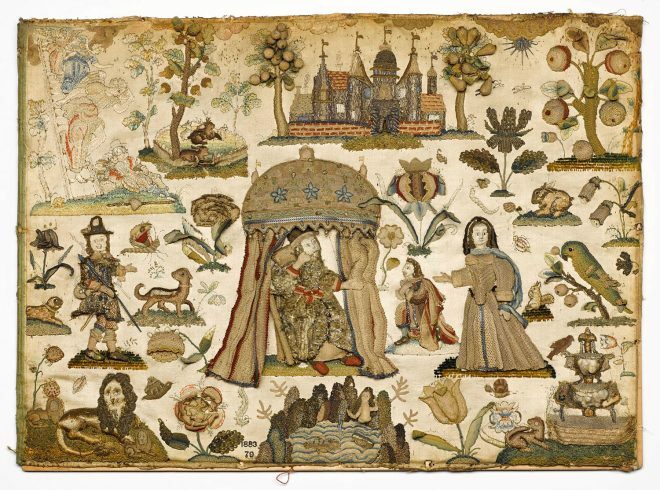 A fascinating 17th century raised embroidery or stump work picture is now on display in the new Art of Living gallery. 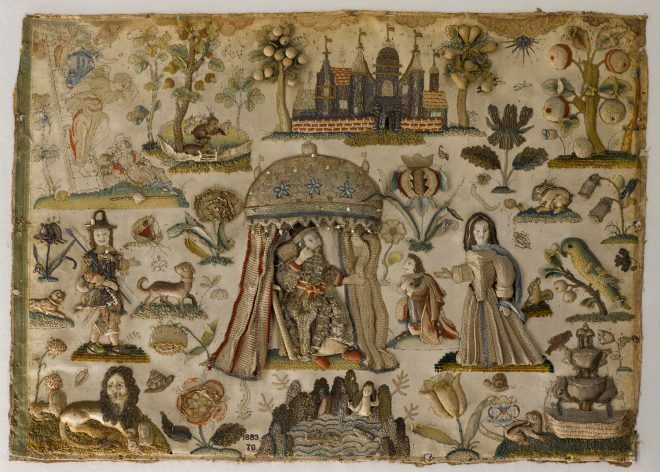 An example of private devotion, it depicts a number of images, including a figure of Solomon receiving the Queen of Sheba, with courtiers paying homage around them. The other figures include a mermaid, animals, flowers, trees, castle, and a representation of the stairway to heaven in Jacob’s dream. The stump work picture before conservation treatment. 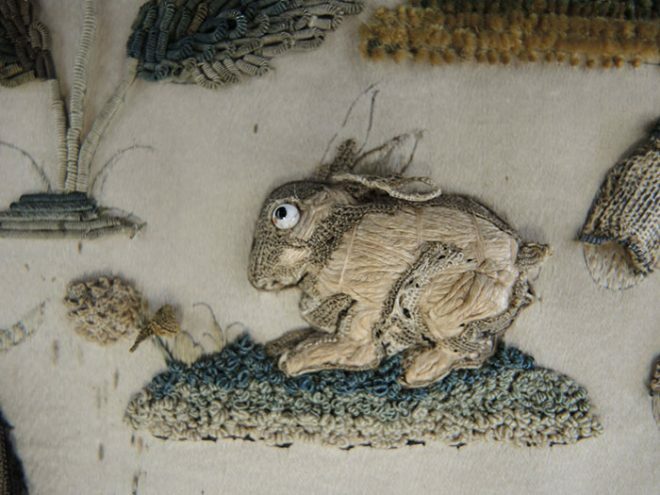 Stump work is also known as raised embroidery because the stitched figures are ‘raised’ from the surface to form a 3D effect. It was used to decorate boxes, mirror frames and panels, and often depicted scenes from the Bible. 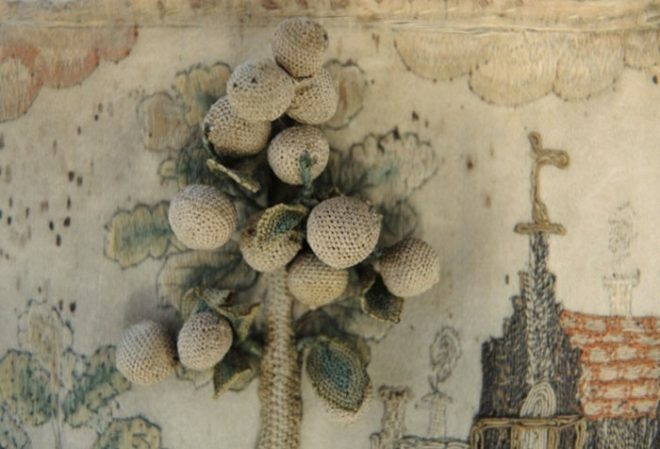 As with many such objects, this embroidery was framed and glazed like a painting at some point in the past. When I first examined the stump work it was in a dark wooden frame. One of the first things I noticed was that the mermaid sitting in the pool had lost her tail! I wondered if it was now lodged somewhere at the bottom of the frame. The mermaid in a rock pool without her tail. As with all conservation processes, I recorded the treatment that was needed to make the stump work stable enough to be displayed safely. This post will give you an insight to this complex conservation project, starting with my initial condition assessment and finishing with attaching it to a mount board for display. When Rachel King, Assistant Curator for the project, confirmed my suspicions that the frame wasn’t original I went ahead and removed the stump work from it. Much to my disappointment the mermaid’s tail wasn’t hiding anywhere. 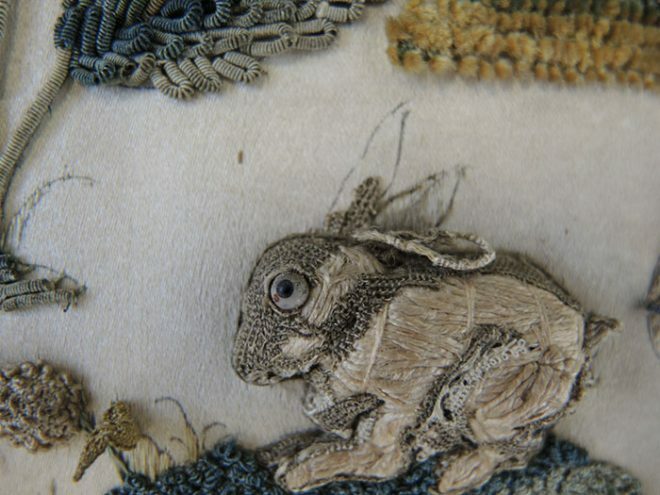 The condition of the embroidery was thoroughly assessed under magnification, and lots of photos were taken. All conservation treatments start with this process, as you need to get to know the object to work out an appropriate treatment to stabilise its condition. It was dusty, brittle and extremely fragile, with tears and splits in the cream coloured silk satin ground fabric. There were several holes around the outer edges made by the nails that had been used to attach it to a mount board. These outer edges had been folded around the mount board. 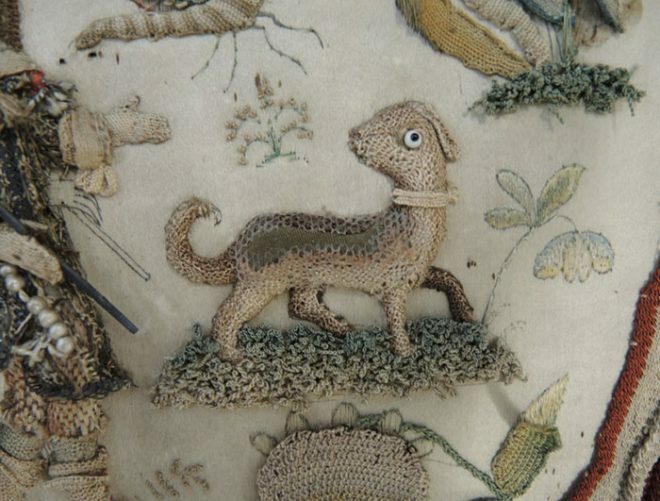 The dog, fountain, rabbit and man’s hat and shoes had lost some of their needle lace embroidery, exposing the cotton wool padding underneath. 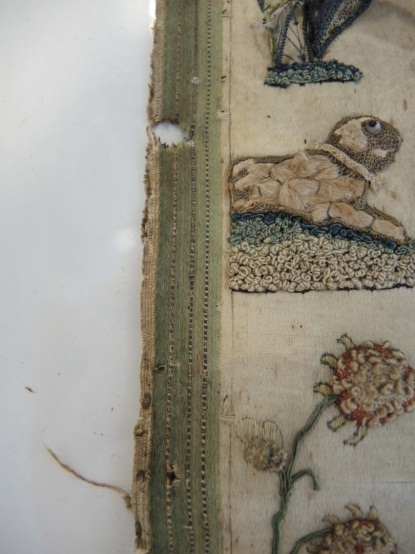 Several areas of the embroidery and metal braid were loose and folded back on themselves. 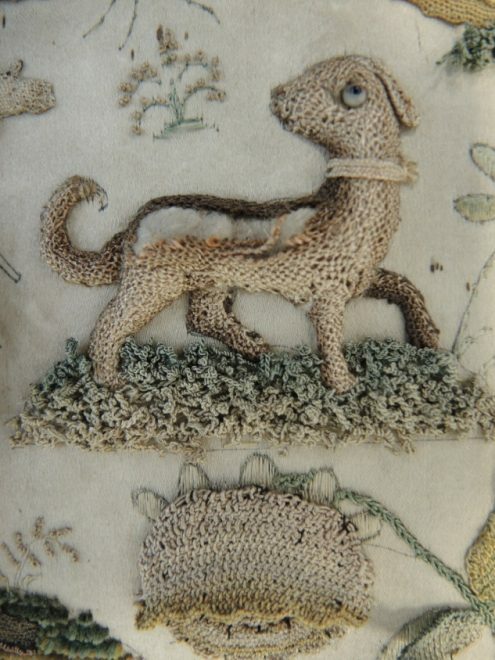 The dog with missing needle lace embroidery, exposing the padding underneath. The stump work was generally very dusty but also very fragile. I carried out a cleaning treatment on the animals’ eyes and the fruit on the trees, as these areas were strong enough to withstand a cleaning treatment. A cotton wool swab moistened with deionised water was very gently rolled over the animals’ eyes. I found this treatment really satisfying as it had immediate and dramatic results. As dust is acidic and extremely damaging to textiles I tried the same method on the fruit, and although it doesn’t appear much cleaner to the naked eye you can see from the cotton wool swabs I collected how much soiling was removed. The rabbit’s eye before swab cleaning. The rabbit’s eye after swab cleaning. 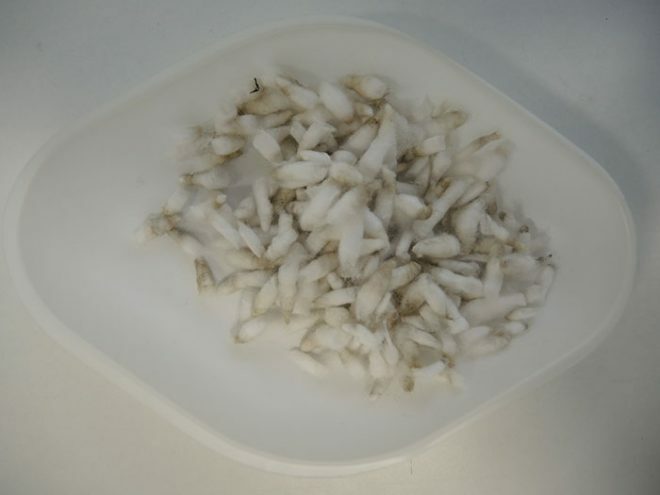 The fruit after swab cleaning. Cotton wool swabs collected after cleaning. When the stump work was removed from the mount board the lower and side edges remained in a folded position. These folded edges were vulnerable to breaking and so were flattened with a contact humidification technique. Humidification is a gentle way of introducing moisture into the fibres, allowing them to be flattened without breaking. The fold in the left side edge of the stump work. The contact humidification treatment to remove the fold lines, using small weights to hold it in place. The left edge of the sampler after conservation treatment. 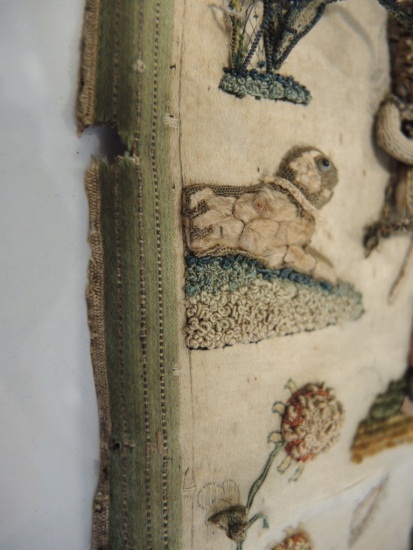 I carried out a patch support treatment on the embroidered motifs that had lost their needle lace, exposing padding beneath. The dog’s back was the biggest challenge. I was wary of breathing too close to the area, as the fibres were so fragile they might have blown away. A small silk patch was carefully tucked in place, with the edges eased under the outer edge of the hole. The nylon net, coated with adhesive, was placed over the top, securing the fragile edges of the hole in the needle lace to the silk patch beneath. The dog after support treatment, showing the infill and the net overlay. This wonderful piece of stump work is still fragile and vulnerable, in spite of the extensive conservation treatment, so it was mounted onto a rigid support board before being put on display. This will prevent any future damage that could be caused by flexing of the brittle fibres, and allows the object to be handled without touching the embroidery itself. 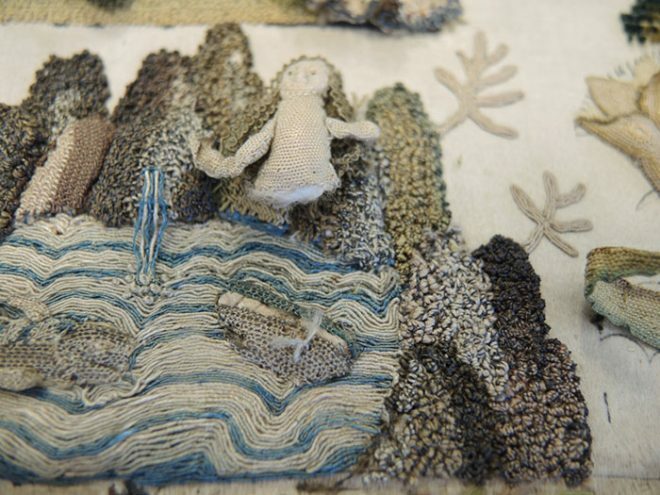 It will be displayed flat as it is too fragile to be displayed like a picture, which will mean it can be easily seen – so do come and see the stump work and see if you can find the mermaid and her tail.